Visual timers are a great way to ease transitions for kids. It lets them know how much time is left, mostly by color depending on the timer, so that they can be prepared when it’s time to end or say goodbye. They can “check in” with the timer so that they know what to expect, instead of being startled by a “times up” right when they are having fun. It’s also useful for a more dreaded activity like grocery shopping or a play, when the child wants to leave. It gently reminds them how much time they have left. So where can you find a visual timer for your child? Right here. This is a list of physical timers. But there are also many timers available as app’s from the App Store for Apple or Google Play for Android. It’s often MUCH easier to have one on your phone, and there are many free options available. When you have one on your phone, you can use it at the doctor’s office, at the store, anywhere. 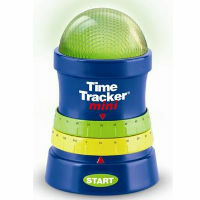 Some kids may prefer a timer with bright colors, pictures or sound effects. 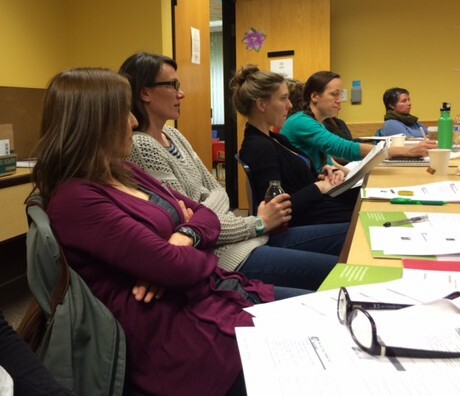 Ask your occupational therapist if you need help choosing one. 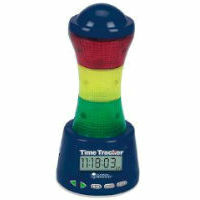 Recommended by Autism and ADHD experts, Time Timer is one of the most popular visual timers available on the market. With an uncluttered interface, silent operation and optional audible alert this timer works great in almost any setting. 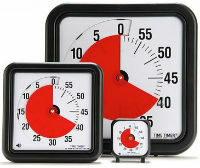 Time Timers come in three, eight and 12 inch sizes, perfect for the classroom, in your home or on the go. Time Tracker is a great visual tool for children with special needs. Following along the lines of a traffic light, Time Tracker uses colors to notify a child that his or her time is almost up. 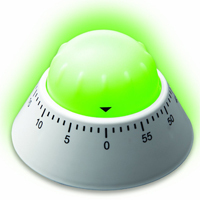 Time Tracker features volume control, a pause feature and quick programming of the lights and sound effects. The Time Tracker Mini is a smaller more simple version of the Time Tracker. The Time Tracker Mini is half the size of the original Time Tracker (4.75 inches tall) and operates easily with just 2 dials. Alarm times on the Mini can be set from 5 minutes to 2 hours, in 5-minute increments. 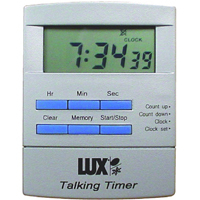 The Lux Talking Timer offers the flexibility to be used as either a precise clock or as a count up/count down timer. A clear spoken voice will announce the time of day or how much time remains until the count down elapses. You can set a timer for up to 23 hours and decide if you would like an audible alarm or not. While this timer was designed with the kitchen in mind, it can also be used for your child with special needs. The Amco Color Alert Timer is useful if you are looking for an inexpensive timer or looking for the added bonus of kitchen use. The timer is a 60 minute timer, that blinks yellow with 10 minutes left and red with one minute left. Above from an article on friendshipcircle blog. Check it out! Spring is here! Check out these fun ideas for outdoor learning and play, now that we can finally get outside. The article appeared from Rasmussen College. Your three-year-old is literally bouncing off the walls, your kindergartener is running the stairs like he has a personal trainer and you’re just wishing you could steal some of their energy for yourself. One thing is for sure: if they stay cooped up in the living room much longer, it’s going to be declared an official disaster zone.What’s the solution? Round them up and head outside! Not only will it give your furniture a relief but the great outdoors holds countless learning opportunities for your kids.We enlisted various experts to provide some examples of outdoor learning activities to help get you started. Try these skill-builders for preschool-aged kids to help your little ones burn off energy while achieving developmental milestones. How it works: Place nature objects with different textures in several brown lunch bags. You could put a pinecone in one, a stick in another and a stone in a third. Have your kids close their eyes and feel each object. Then send them outside to find a similar texture. As they find matching objects, introduce texture words like pointy, bumpy and smooth. How it promotes learning: All of those new words will expand your little ones’ vocabulary. Discriminating between different textures also supports fine-motor skills like coloring and writing, according to pediatric occupational therapist Christie Kiley. How it promotes learning: You can probably guess that this game teaches counting and social interaction skills. Koscinski explains that catching a ball using both hands also teaches bilateral integration, a necessary skill for learning tasks such as cutting, buttoning and tying shoes. How it works: Yep, this is just what it sounds like! Believe it or not, your little ones can help with the gardening and learn at the same time—it’s a win-win! How it promotes learning: All that digging and pulling is great for sensory exploration as well as building hand and finger strength, explains Kiley. How it works: Get creative with pool noodles and design an obstacle course. Lay them on the ground, cut them in half, attach them to a fence or hang them from a branch. Challenge your kids to jump over them, limbo under them, crawl around them or walk on them like a balance beam. How it promotes learning: Getting up and moving helps kids build core muscle strength. Koscinksi explains that this will later be used for completing school tasks seated at the desk. How it works: Nature offers plenty of discoveries for kids. Help them explore by encouraging them to find certain types of leaves, bugs, rocks and flowers. How it promotes learning: A nature hike encourages observation skills, fine-motor skills, hand-eye coordination and the use of the five senses in exploring, according to Barbara Harvey, author of Journeys Through Parenthood and executive director of Parents, Teachers, and Advocates. 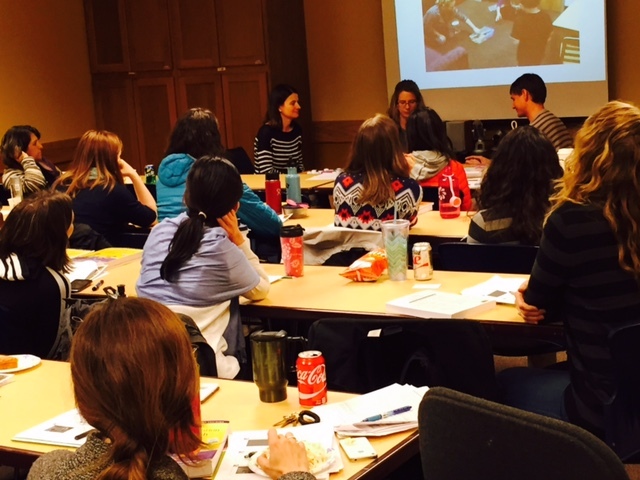 How it works: Miriam Manela is the owner of Thrive Occupational Therapy and recommends this activity in her book The Parent-Child Dance. As the “critter,” you slowly inch your way around the yard while narrating your movements. You might say, “I’m climbing up the swing set. What letter does ‘swing’ start with?” Try to work in new words like climb, reverse and descend. Your kids are the “trackers.” It’s their job to follow you with their eyes and think about your questions. How it promotes learning: Critter Quest improves eye movement and tracking, plus it can be used to strengthen vocabulary, letter recognition and phonetics. How it works: Koscinski suggests using sidewalk chalk to write numbers and letters in different colors. Then ask kids to jump on the number, letter or color that’s called out. How it promotes learning: This activity helps develop gross-motor skills, counting skills and letter, number and color recognition. How it promotes learning: Kids get to practice following simple instructions while being active. Kiley adds that the dance actions help them develop body awareness, coordination and balance. How it works: Line up several hula hoops and have kids hop into the middle of each hoop with both feet, explains Koscinski. Make it a bit more challenging by encouraging them to hop into one hoop with their right foot and the next hoop with their left. How it promotes learning: All that hopping builds gross-motor coordination skills, which are necessary for sports and bike riding. How it works: Gather your young artists and some paint (watercolors or liquid tempera) near a flowerbed. Watch them create their newest masterpiece! How it promotes learning: Kids will hone their observation skills and learn about colors. Kiley recommends offering paintbrushes with a built-in grip to promote a mature grasp. These 10 outdoor learning activities will have you having fun with your rug rats in no time. They won’t even realize you’re teaching them new skills instead of watching them tear up the house. Your search for educational opportunities for children might be a sign you should be doing this for a living.Learn more about other signs you should be teaching preschool! External links provided on Rasmussen.edu are for reference only.